Our special fruitcake recipe, which calls for delectable candied fruit and premium nuts, results in dense, delicious fruitcake that's hard to resist. We mix it in small batches right here in our bakery and deliver it in a noteworthy keepsake tin. 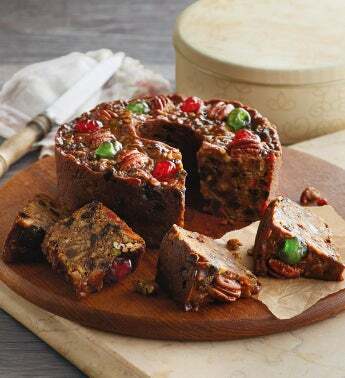 You'll be proud to bring this fruitcake with its big pieces of candied fruit and nuts along to your next holiday party.